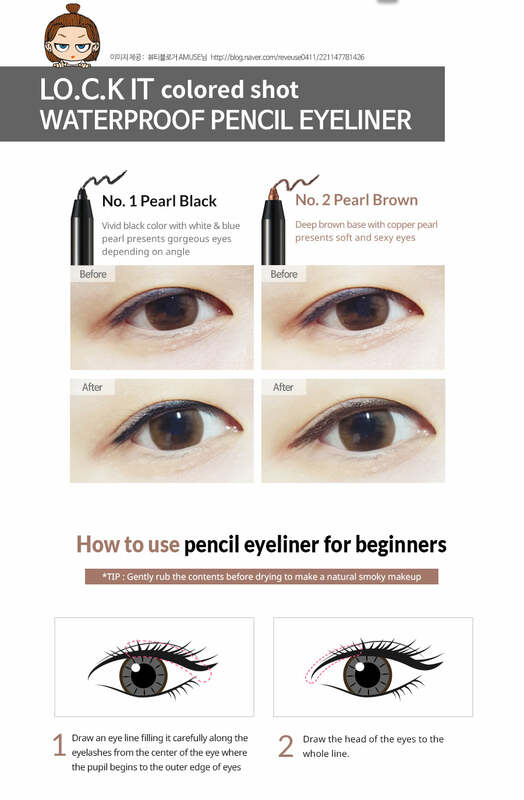 The Waterproof Pencil Eyeliner brings you everything you desire in your eye makeup- a long lasting, smooth, gel like finish. The twist-up pencil saves time and can create fine or wide dramatic looks. It also stays soft enough to be blended on the eyelid as an eyeshadow, while still remaining smudge-proof. The Pearl Black shade is a bold black colour, with a white and blue pearl finish. The Pearl Brown shade is a soft, deep brown, with a copper pearl finish, for alluring eyes. 1) Hold the eyelid taut and gently outline the rim of the eyelid, drawing as close to the lashline as possible. 2) You can also use the pencil to draw on the waterline.